Andy Summers (l) during the press conference for his film CAN’T STAND LOSING YOU held at the London West Hotel in West Hollywood, CA. ©Front Row Features/Pacific Rim Video. HOLLYWOOD—A fit middle-aged man with sun-bleached blond hair and a tan strolls into a tony Beverly Hills hotel ballroom dressed mostly in black. His open jacket reveals a bright pink t-shirt emblazoned with the words “surfer” in lower-case white letters. While this Southern California archetype may very well have taken a morning dip in the cool Pacific earlier in the day, this is no garden variety beach bum. He’s British transplant Andy Summers, guitarist and sometime vocalist for the classic punk/rock band The Police. He’s here to promote his new documentary cleverly titled “Can’t Stand Losing You: Surviving The Police.” Though the title might suggest a tell-all about the three-piece British band that enjoyed a meteoric nine-year run in the late ‘70s into the mid-‘80s, it is a much more measured and thoughtful retrospect of the group, whose hits include “Roxanne,” “Message in a Bottle,” “Every Breath You Take” and more. Directed by Andy Grieve and Lauren Lazin, the documentary is based on Summers’ bestselling memoir “One Train Later,” a slick tome illustrated with dozens of pictures the Grammy award winning guitarist took during the part of his career where he performed alongside lead singer/bass guitarist Gordon Sumner (better known as Sting) and drummer Stewart Copeland (the only American in the group) as well as during a 2007-08 reunion tour. Summers explained that he wanted to make a documentary because he wanted to share this extraordinary chapter in his life. Q: What was it that made you want to do this film? Summers: The impetus really came from another film called “The Kid Stays in the Picture” (a documentary about legendary Hollywood producer Robert Evans) that was basically made from still photographs and a voiceover. That was the inspiration for this because that film is very good and I realized that maybe I had a parallel sort of rock ‘n roll version of the same stuff, the whole life story in book form and the photographs of all those years that I’d been through. Q: What made you decide to include the love story between you and your wife, Kate, in the documentary? That seems to be very personal. Was it a mutual decision? Summers: Well, she didn’t fight it. She was like, “Do I really have to be in it? Ugh.” I think it actually lends a softness and fragility to the film that you don’t see in the usual absolutely all-male rock documentaries. It makes it more a life story, which is really what it’s about. It gives a different angle to the film that you’re not normally going to see, and it was very important to me, and it has a good ending. It is sort of a subplot of the film. Q: There is a lot of redemption in this. You lived to tell the tale. Summers: The redemption was like coming back with the band and proving that we really were that good. That was the effort, not to go out and try an exercise in nostalgia. I suppose we had to redeem ourselves in the fact that we got off at the absolute peak of worldwide popularity, and sort of left everyone gasping for more. It was kind of like, “Sorry about that, and now we had to kind of redeem ourselves by doing this great concert tour for all you kids out there,” and we did it. So I think that was really the story there. Q: Is this a cautionary tale? And, if you had to put it in one sentence why The Police broke up (in 1986), what would you say? Summers: The one word would be ego. And, yes, to some extent, it is a cautionary tale. I think people could view it as a cautionary tale or not. The central message in the book, for me, was, “I’m a guitarist. I’m absolutely dedicated to music. It’s all I want to do. It’s the only thing I can do. And this is what gets me through the ups and downs, the poverty, the starvation (and) the riches—all the things that go along with doing it.” (It’s about) sustaining that life through the act of playing music. This is the message I tried to get through in the book. If it’s a cautionary tale, it’s like, “If you want to be an artist, a musician, you’d better get ready because it’s going to take a lot.” I’m one of the very lucky ones that got all the way there, but this doesn’t happen to a lot of people. But it was certainly an act of faith. Q: The documentary shows when you had a photo exhibit and Sting and Stewart showed up for that, and everything seemed cool and copacetic. What’s it going to be like when they see this movie? Summers: They’ve actually been very sweet and supportive. I got an e-mail from Sting a few days ago and Stewart loves the film. Let me just put that in this framework. You know, we get pasted a lot that we just hate each other’s guts all the time (and) that’s all there is. But it’s really not true. We went through an incredible life experience together, and that’s very bonding. None of the three of us will ever have that experience with anyone else. No one else, except the three of us, knows what it’s like. So there is absolutely a bond and a fraternity there. Despite the sort of difficulties of being a band, there’s something else that we’re all glued together by. And I think there’s a certain amount of love there. I think it’s very important to say that. So, actually, they’ve been supportive, and I think it’s great for everyone. This (film) is like we’re going out together again and extending the name of the band even more. Q: Did they give you any notes on the script at all? Summers: They didn’t. We were very sort of respectful and probably a bit nervous about the other two, each one of us. I said, “Look, I’m making this film.” And, of course, as you can see in the film, there’s a lot of live footage of us playing in 2007 and 2008. So I had a film crew coming around not only filming me but them as well. It’s sort of intrusive and invasive, and (I wondered) if this was going to be really touchy and difficult. They sort of went along with it pretty much. I wouldn’t say they wholeheartedly embraced it but they let it happen. Now that we have a very good product on our hands, I think they’re going, “OK. It’s great.” As they did when the book came out, they were both very supportive. So, going back to the larger picture, the truth about us is, we have a marriage —the other marriage—and we all stand back to back, when it comes down to it, as we always have done. We’re very protective (of each other). Q: This film is a nice complement to Sting’s “Bring on the Night,” and Stewart’s “Everyone Stares: The Police Inside Out” documentaries. Was that something that influenced your documentary’s style? Summers: Yes. It’s obviously from my point of view, so it’s coming from a different angle. My writing of the book and also the fact that I photographed it all the way through—no one else did, so I had a larger portion of the three of us of documentation. It was pretty organic at the time. I was photographing away, having a great time just taking pictures. At some point, I got the notion that, “Hey, this is an incredible life experience, so I’d better document even more of it,” which I did. 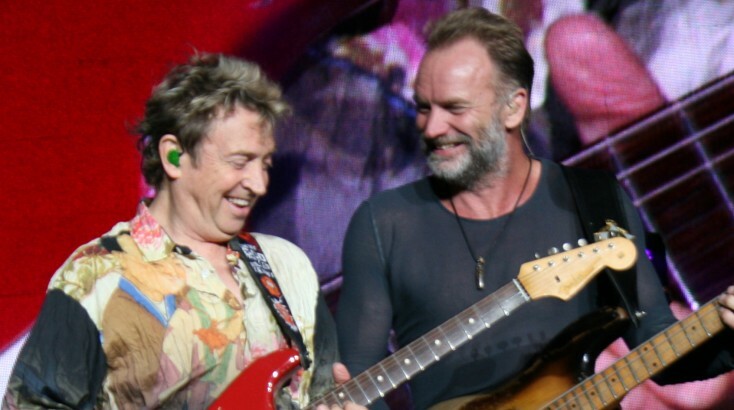 Q: Was that last tour of The Police really the last tour or do you envision doing some smaller gigs? Do you feel like you got it all out of your system? I know you don’t like the word “closure,” but do you feel like you can move onto the next chapter of your life now? Summers: It all sounds really comfortable but I don’t think it’s true. I think the word “closure” is sort of a terrible word, really. Why would you want to close down really on something that is so magnificent as the career that was The Police? It would be not a good thing. Also, I’m not into smaller gigs; I like the bigger ones. Let’s keep it up there. I’m sort of joking but, of course, the truth is a gig is a gig. Oddly enough, I can tell you as a musician, the smaller gigs are much more intimidating than the bigger ones. The stadiums just kind of bland out and you can’t really see anyone. You’re trying to feel it but the (audience) is just sort of out there in this vast, almost two-dimensional plane. Arenas are better because (the audience) is around you; you can feel it more. Really, the best place to play music is in a club. It’s really true, because you feel the people and you feel like you’re much more on the spot. Q: Do you play small clubs? Summers: I’ve played every small club in the world. I’ve played all sorts of clubs. After The Police, I was playing jazz, actually. I did it for years. I played all the festivals and some very nice clubs all over the world. I’m not doing it right now; I don’t really want to because I did so much of it. I’m doing different things than that. I say that but I did actually play in Shanghai not too long ago, in a club, and it was amazing. We just ripped the place apart. It was just so much fun, and now they want us back. I’m now getting offered all these clubs in China. I’m not sure if I want to do it, though. Q: In the documentary, you happen upon a karaoke bar in Japan where a Police song is playing. Did that really happen? Summers: It was completely real, completely spontaneous and sort of miraculous. It was at about 1 a.m. in Tokyo, on a very cold, snowy night in February. We’d wrapped, we were done, and we were walking out of there, the Golden Gai, this little area in Shinjuku, and suddenly (we heard) “Every Breath You Take.” The camera guy is still running his camera, following me, and we walked in and that happened. Q: Did the bar patrons really recognize you?